Fantastic multi-purpose contact grill suitable for making toasted sandwiches, grilling meat, poultry, fish, shellfish, snacks, vegetables, potatoes, etc. The grill plates have a groove system reducing fat absorption for deliciously "light" food. 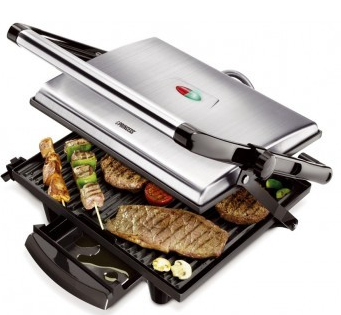 The unique floating top section automatically adjusts its position to the thickness of the food to be grilled. With a non-stick coating, a collection tray for excess fat, indicator lights and a handle that stays cool. 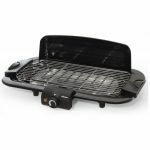 This fantastic multi-purpose contact grill suitable for making grilled sandwiches, grilling meat, poultry, fish, shellfish, snacks, vegetables, potatoes, etc. 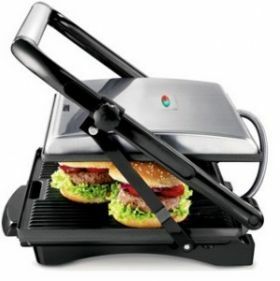 The unique floating top section automatically adjusts its position to the thickness of the food to be grilled. 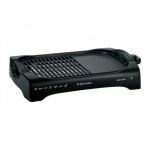 This makes it easy to prepare all types of dishes on this contact grill. 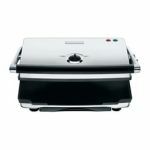 The grill plates have a groove system which reduces fat absorption for deliciously lean food. Comes complete with a drip tray to prevent mess at the table or on the counter top.